It was Foo Fighters first show since Dave Grohl broke his leg in Sweden. On Saturday (July 4th) Foo Fighters made their live return in Washington, US. 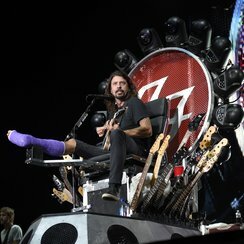 Dave Grohl, who had previously broken his leg, performed the show from a huge throne. The show marked twenty years since the release of Foo Fighters' debut album. The throne, from which Grohl performed the whole set, featured a giant Foo Fighters logo, lights, guitar necks and an extended support for Dave's leg. After falling off stage in Sweden and breaking his leg, Dave Grohl and Foo Fighters were forced to cancel a number of dates, including Wembley Stadium shows and a headline performance at Glastonbury Festival. Foo Fighters will now tour the US for the remainder of the summer before heading back to Europe in November. Their latest album, Sonic Highways, is out now.